At the same time, Ocasio-Cortez's campaign committee and two PACs paid almost $900,000 to a consulting company for campaign services, providing few details on what the money was for or who ultimately received it. David Mitrani, a lawyer for Ocasio-Cortez, the PACs and the company, in a statement said any implication "that these entities in any way operated with less than full transparency or in some way to skirt the law, are absolutely and unequivocally false." Supporters say her high profile and social-media prowess have made her a target for conservative groups, some of which are leveling flimsy accusations in hopes of dimming the House's fastest-rising star. "It's right-wing groups that are really questionable in what they're doing," Corbin Trent, a spokesman for Ocasio-Cortez, said. 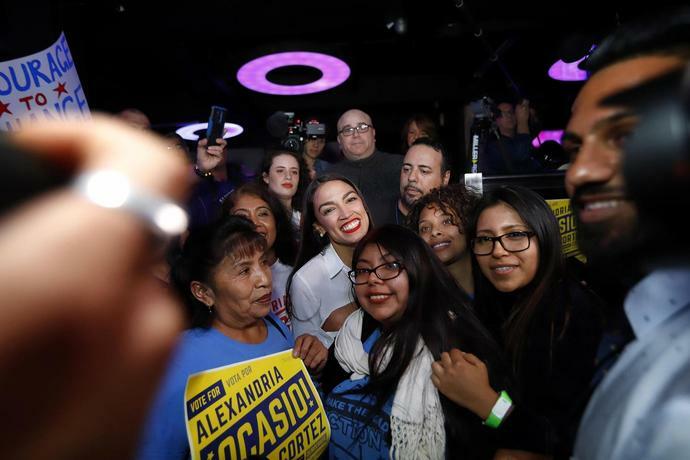 The allegations in the complaints are narrowly focused and unlikely to tarnish Ocasio-Cortez, some election-law experts said. "I haven't come up with anything that's a serious violation of campaign finance laws," said Paul S. Ryan, vice president of policy and litigation at Common Cause, a nonprofit group that promotes civic participation. The complaint says the arrangement hid the true purpose, and actual recipients, of the money. It doesn't say what those were, only that the spending may not have been reported properly. The conservative group also wants the FEC to audit the PAC payments to the company. If either PAC spent more than $5,000 to influence a candidate's election, that would violate campaign-finance law, which limits PAC contributions to $5,000. Ocasio-Cortez served on the board of Justice Democrats, but "had no control over expenditures or day-to-day activities," Mitrani said. Another group, the Coolidge Reagan Foundation, a conservative Washington, D.C., nonprofit, filed a separate complaint in February. It accuses Ocasio-Cortez's campaign of laundering $6,000 in 2017 through one of the PACs and the corporation to pay Riley Roberts, the boyfriend of Ocasio-Cortez, for campaign work. According to Trent, Roberts did digital marketing work for one of the PACs, and did no work for any campaign. Some legal experts say they don't take the Coolidge Reagan Foundation accusation seriously because it offers no evidence. The NLPC charges could be another matter. A close look at the interactions among the two PACS and the LLC reveals an unusual arrangement. Payments went to a company owned by Saikat Chakrabarti, now Ocasio-Cortez's chief of staff, with little explanation of its purpose. Chakrabarti, 33, is a Harvard graduate and Silicon Valley entrepreneur who co-founded Mockingbird, a web-design tool, and was involved in the startup of payments processor Stripe Inc. He, Ocasio-Cortez, and her spokesman, Trent, all worked on Vermont Senator Bernie Sanders's first presidential campaign. Trent also worked for Justice Democrats before joining the Ocasio-Cortez campaign. As co-manager and then chairman of Ocasio-Cortez's campaign in the final months of the 2018 election, Chakrabarti wore many hats. In addition to owning the company to which the PAC payments were made, he also co-founded the Brand New Congress PAC in 2016 and Justice Democrats in 2017. The PACs were supposed to provide a "campaign in a box" tool set, complete with all the logistics needed to run for office. By outsourcing fundraising, communications and organizing, candidates were free to concentrate on campaigning. Chakrabarti has said he wanted to continue the momentum from the Sanders campaign by recruiting nontraditional House and Senate candidates who would pursue Sanders's vision. Because of the $5,000 limit on PAC support for candidates, Chakrabarti formed the LLC to provide those services. The PACs would help candidates raise the money to pay for the company's services. Thirteen campaign committees, including that of Ocasio-Cortez, signed on. Mitrani said Chakrabarti received no salary or other compensation from the LLC, the PACs or Ocasio-Cortez. The arrangement was unusual but not unprecedented. Most campaigns rely on media buyers, fundraisers, consulting firms and other contractors, but generally don't rely on PACs to provide them. FEC rules allow a candidate's participation in such arrangements. "Ocasio-Cortez's involvement would be akin to the hundreds and hundreds of candidates who run leadership PACs," said Common Cause's Ryan. The LLC's biggest customers, however, weren't campaigns. Collectively, the 13 candidates paid only $173,102 to the company, $18,721 of which came from Ocasio-Cortez. Justice Democrats paid the company $605,849 and the Brand New Congress PAC paid it $261,165. When Ocasio-Cortez and the other candidates filed spending reports, they listed the purpose of LLC payments as "strategic consulting" or "strategic consulting services." This is what the NLPC asks the FEC to investigate. Its complaint cites numerous posts from the Brand New Congress PAC's website describing other services it rendered to candidates, including canvassing and fundraising, that don't fit the FEC's definition of consulting. It claims the payments to the LLC constituted an "extensive off-the-books operation" to influence federal elections. The NLPC doesn't say the payments violated contribution limits. "Our complaint kind of leads there but we wanted to make it ironclad by going with the most obvious violation," Peter Flaherty, the NLPC chairman, said. He called the relationship between the congresswoman's campaign, the PACs and the LLC "a bit of a tangle," and said his group might add to its complaint. The campaign-in-a-box arrangement was abandoned at the end of August 2017, according to Mitrani, because it wasn't sustainable with so many campaigns to manage. Candidates instead reimbursed the PACs directly for any services rendered. FEC records show Ocasio-Cortez's campaign paid Justice Democrats $41,109 for various services. The Coolidge Reagan complaint is based on tweets and a blog post on Medium.com by Luke Thompson, a Republican campaign operative who worked for Right to Rise USA, the super political action committee that backed Jeb Bush's presidential candidacy. "Whoah: the creepy org filing bogus ethics complaints against me just *actually* got hit with one of the biggest fines in FEC history," a bemused Ocasio-Cortez tweeted, getting the organization, or "org" as she put it, behind the complaint wrong. The NLPC complaint could fizzle, or amount to little more than a paperwork violation. But Ocasio-Cortez, who has called the campaign finance system "fundamentally broken" due to the influence of corporate PACs, proved herself adept at leveraging it in her own election effort.